After a 2-4 start to the last road trip of the season, the Reds (65-88) look to finish strong in Miami. First pitch is at 7:10 ET. The Marlins (59-92) currently sit in last place in the NL East, traded all of the star players, and are struggling to average 10,000 fans a game–their average attendance is nearly 5,000 less than Tampa Bay’s average attendance. Unlike the Reds who look to be on the cusp of being good again (if they add pitching), the Marlins have a long way to go in their rebuild. Despite that, the Marlins own a 2-1 record against the Reds this season; that series was, however, in the early part of May and at the tail end of their April swoon. If you peruse the Marlins’ roster, you might see a few familiar names, such as former Reds Dan Straily (out for the rest of 2018 with an oblique injury) and Chad Wallach or other familiar names like Starlin Castro and Cameron Maybin. But the majority of players on the Marlins roster I have never heard of, and I consider myself fairly knowledgable when it comes to names of baseball players. The Marlins are the only team in the National League with a worse overall team ERA than the Reds, with a 4.86 ERA to the Reds’ 4.70, but the Reds have a higher FIP at 4.73 to the Marlins’ 4.59. The Marlins also have the worst team OPS in the NL, at .664. The Reds’ are 7th in the league with a team OPS of .736. *BrighamÃ¢â‚¬â„¢s numbers are from Triple-A New Orleans. Tonight will be Cody ReedÃ¢â‚¬â„¢s fifth start in the rotation this season. HeÃ¢â‚¬â„¢ll look to build on his best start, and possibly best appearance of 2018, when he pitched five scoreless innings and struck out ten last Saturday against the Cubs. Aside from his appearance against the Pirates, Reed has acquitted himself quite well in September and has likely earned at least spring training consideration for the 2019 rotation. Reed used his changeup a lot more against the Cubs than he did in the game against the Pirates on Sept. 4, when he gave up six runs in five innings. When he can command his breaking stuff (which has consistently topped out in the mid to high-80s this season), heÃ¢â‚¬â„¢s at his best. If Reed relies too heavily on his fastball, he tends to have bad outings. Two Marlins batters have faced Reed in their careers: J.T. Realmuto is 0-for-3, and Miguel Rojas is 1-for-2. A fourth round selection by the Dodgers in the 2014 draft, Jeff Brigham made his major league debut for the Marlins on Sept. 2, pitching three innings and giving up three runs on four hits while walking four and striking out two. His second start against the Mets last Thursday went a little better. He made it through 4.1 innings, while giving up five hits and three runs, while striking out two and walking one. Brigham was part of a blockbuster three team trade in July 2015 between the Dodgers, Marlins, and Atlanta Braves that sent Jose Peraza from the Braves to the Dodgers. (Fun fact: Bronson Arroyo and Mat Latos were also part of that trade, as was current Dodgers starter Alex Wood). Brigham started 17 games in the minors in 2018 and compiled a 2.36 ERA with 94 strikeouts, 24 walks, and eight home runs surrendered. He started the season at Double-A and pitched brilliantly there (2.42 FIP), but struggled at Triple-A (4.45 FIP) when the Marlins promoted him in mid-July. Brigham throws mostly two pitches: fastball and slider, but will occasionally mix in a changeup as well. Through his first two starts, his velocity for his fastball was in the lower 90s, while his slider was high-70s and low-80s. 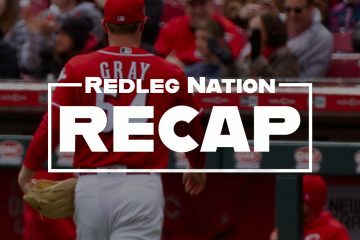 -NL batting update, if you are interested in such things: Scooter Gennett trails Christian Yelich by .002 percentage points, .319 to .317. In the ninth inning of last night’s game, Joey Votto drew a walk. It’s significant because it was the 1,100th walk of his career. Votto is now just 110 walks behind Pete Rose for most all-time walks in Reds history. He’s currently 78th on the all-time MLB walks list. 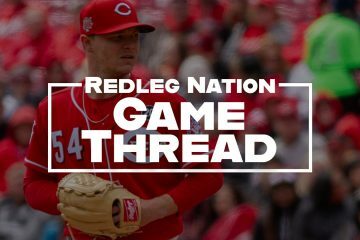 -Important thread on the Reds Twitter account this morning. Here are some of the photos.
? "Welcome to Miami" ? ? We are going to WIn, We are going to win. Well I’m glad they’re still having fun. If the Reds announced attendance based solely on tickets sold, how many games would be less than 10,000? More than a few, IMO. 5 games. That is all that separates in the standings between “Positive Momentum” and Year 1 of Miami’s Cubs/Astros level tank and rebuild. Anyone wagering that Derek Jeter will have the Marlins losing 90+ games in 2021, Year 4 of Miami’s rebuild? Based on him showing so far that he “gets” what a small-budget team has to do….I would not bet against him. Interesting because Dan Szymborski of FanGraphs offered the opposite opinion. I have no idea either way but at this point just hope that the Reds make the playoffs before the fish. otherwise, we are in big trouble. I wouldn’t bet on it.Baseball guy running a baseball team and we have well you know. Isn’t Jeter the nincompoop who traded the Christian Yelich contract for a song? We were saying the price was pretty steep, actually… but in hindsight, yea the Brewers got a good deal. Yelich stepped it up an extra notch, count me surprised… I knew he was good defensively, could run, had good OBP… didn’t expect him to compete for the batting title. …or hit 30+ home runs… yikes, just checked his #s… looks like a solid MVP candidate. Nincompoop. That is SO very harsh. But yeah, that was a pretty dumb deal, overall. We could have gotten Yelich too, if we would have parted with a couple of really good prospects (Senzel and Hunter Greene, for instance). Or Aquino, or Travisto, or howard, or a bunch of other starters that are not the #2 Prospects in all of baseball. Or a “generational talent” to trade for a guy, that 2 of our prospects WILL not might, but WILL out product in 2 years for 1/10th the price Combined. You all sound like arizona diamondback fans saying that they should trade Max Scherzer… oh wait. Yeah we are talking about a team with nobody on it that has completely tanked and they are only 6 wins below the Reds. 6 wins. Who should be embarrassed? We are 3-51 with runners in scoring position in our last 8 games + 2 innings.Two of those hits didn’t score a run.That’s awful. Yea, why would we want to say that Jim? So Gabriel Guerrero gets to ride the pines, as well as Dilson Herrera and Dixon. I agree we don’t need an audition.We already know how to lose and lose a lot.Hey when your good at it I mean your good at it. Wait add one more to the tally,its now 3-52. Down goes Joey swinging again and its now up to 3-53. The legend adds one on the good side and it now 4-54 and wait for it wait for it we lead 2-0. Brantley said it the last game Reed started, when Reed bends over and follows through he is a good pitcher and when he stands up and flails away with his arm in the air , he is a bad pitcher. Welsh just commented on it. Reed has been great but I thought the offense would show up but they are awful again tonight.Guess it has been a long season but I am disappointed they seem to have just quit.Almost like they are in a hurry to just get it over with. Scooter homered as I was typing.He has knocked in all 4 runs. Cody is getting it together. Zero walks in 6 innings. Real good news. Scooter said Yelich who? Riggles is right and wrong, about the line ups, and auditions. Infield is set for next year already. (NO, Scooter is not getting Traded, furthermore trading scooter is a bad idea so get it out your head). Center field replacement would be by committee, meaning Ervin, and schebs, (assuming they move on from Hamilton) which would explain the Senzel move. You have Schebs, Wink, Ervin, Senzel? FA/Williams? not sold on), Infield Backups will be Blandino and Dixon. So Herrera Is on the Outside looking in, (i swear he is on drugs, or something, there has to be a backstory). The Reds need Starting Pitching, and obviously they can only “audition” one of those a night. Votto needs a strengthening regiment in the off season… he joked about getting fat in the off season, but he lost power there is no doubt about it… he now has warning track power and it will only get worse as he ages. According to statistics (which can sometimes lie), his exit velocity on batted balls is about the same as last year. But he is not getting elevation on some of the balls he has hit, which could have gone out of the park. 2) he is hitting at “hittable” pitches, but is actually slowing down (by a split second) and hitting the ball a little deeper in the hitting zone, and not quite as far out in front, and therefore not getting elevation. Look at what the Oakland A’s have allegedly done by consciously trying to get more elevation. A lot more home runs and runs scored this year, especially in the second half. Interesting approach. He chokes up more. Little thing called angular momentum. Absolutely fantastic start by Reed. 0 runs, 0 walks. He is really laying claim to a rotation spot. They sure need a LH starter. Other than Scooter, the offense is pretty lame again. Have a game, Scooter Gennett!